It seems Europe, New Zealand and Australia will be getting an additional collector's edition for BioShock 2. Today 2K Games announced the Rapture Edition of the game. The Rapture Edition has much less swag than the previously announced Special Edition. It's just a copy of the game and a 96-page hardcover art book. No doubt it's a bit cheaper than the Special Edition as well, though the exact price wasn't revealed. Note that those three territories mentioned above are getting both of these bundles so you'll have a choice. Over here in the States, we won't be so fortunate. "It is not coming to the US," stated the official BioShock 2 Twitter a short while ago. The Rapture Edition is available for preorder at select retailers starting today. 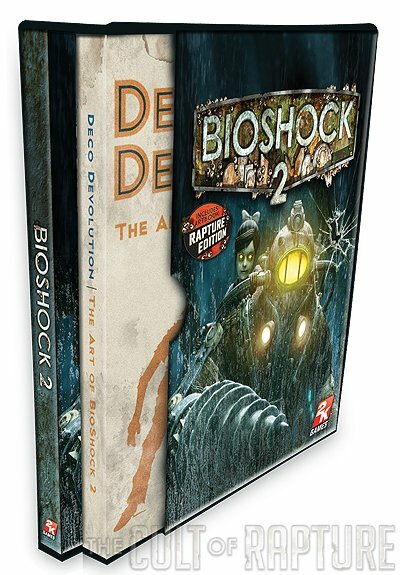 Both collector's edition of BioShock 2 will be limited to a single production run. The game's set to hit stores on February 9th.